Located five kilometers south of the heart of Dumaguete, Sta. Monica Beach Club may be away from the action but, on the other hand, provides a quiet beachside getaway that’s still accessible from the city. Managed by One-Of Collection, the same guys behind Amorita Resort in Bohol and The Funny Lion in Coron, the boutique resort has roomy quarters and a contemporary-rustic ambiance that feels exclusive yet low-key. The property sits right along an east-facing gray-sand beach facing Cebu and Siquijor islands, a panorama which rewards early risers with the famed sunrises over Tañon Strait that Dumaguete City is known for. Since it’s situated near the city’s southern border, Sta. Monica Beach Club provides accessibility not only to Dumaguete but the the small neighboring municipality of Bacong, known for its impressive town church with a Spanish-period organ, its world-class stone craft and its place in history as the birthplace of revolutionary Pantaleon Villegas, also known as Leon Kilat, who fought against Spanish colonial rule. The resort schedules complimentary tours of Dumaguete and Bacong. From the resort, it’s also easy to access the scuba diving town of Dauin, the jumping off point to Apo Island, and the mountain town of Valencia, known for its waterfalls, hot springs and volcanic vents. Early risers will be rewarded with Dumaguete’s famed sunrises right along the resort. Sta. 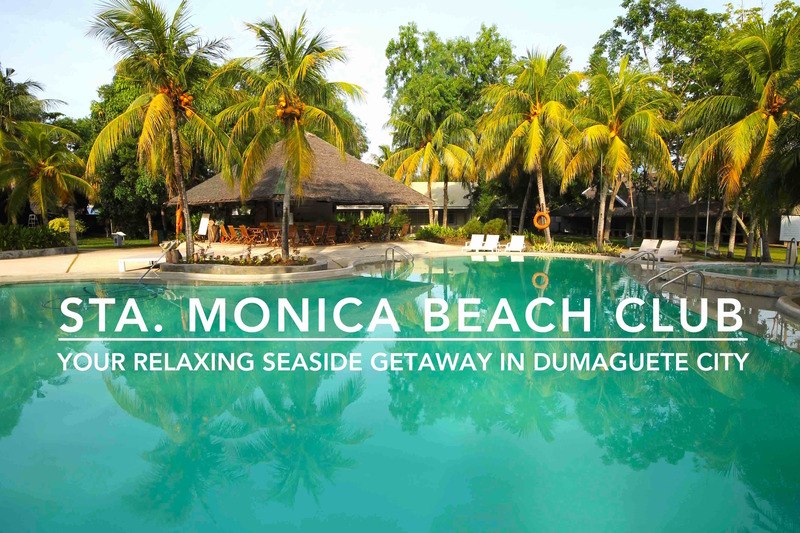 Monica Beach Club offers complimentary historic tours of Dumaguete and Bacong. Sta Monica Beach Club has 27 rooms surrounding a swimming pool and landscaped garden – including deluxe rooms, loft-type family rooms, and a beach house for bigger groups with three bedrooms and their own private dining, living and kitchen areas. Among the properties of One-Of Collection, this resort has the best interiors, which really evoke a tropical vibe with its Filipino and nature-inspired details like capiz windows and leaf motifs on pillows and upholstery. I wish they had kept the nipa roofing of the rooms to maintain the rustic look, as they were the process in replacing with iron sheets on my visit. Each of the rooms have an LED cable TV, individually controlled air-conditioning unit, private toilet and bath, shower with hot and cold options, bath amenities with organic soap and shampoo, in-room safety deposit vault, and tea and coffee-making facilities. For dining options, there’s a poolside bar and restaurant, and a larger restaurant along the beachfront. The resort is also a popular venue for special occasions and events, who book the conference hall or poolside for wedding receptions, debuts, company events and other celebrations. In-house dive center Oceanism offers scuba diving and snorkeling trips along the Dauin coasts, which is known for its muck sites and turtle sanctuaries. Filipino and nature-inspired interiors lend a relaxing tropical ambiance. A three-bedroom beach house offers enough room to host bigger families and barkadas! All rooms come with complimentary breakfast – either plated or buffet, depending on the number of guests, offering either Filipino or Continental fare, served at the beachfront restaurant or in the comfort and privacy of your room. Among the local offerings in the buffet is sikwate (native chocolate drink) served the traditional way in a cast-iron pitcher called tsokolatera. Accommodation at Sta. Monica Beach Club starts at PHP 3,375 for a Deluxe Room King or Deluxe Room Double (both good for two persons), and PHP 4,725 for the loft-type Family Room. Rates include daily breakfast, complimentary mini-bar replenished daily and applicable government tax. Find discounted room rates here! Savor Filipino and Western fare at their beachfront restaurant. Sip a cocktail or fruit shake at their poolside bar and restaurant. A chartered tricycle from Dumaguete Aiport or Sibulan Port (where passenger boats arrive from Cebu) would cost PHP 150, while one from the town center would be PHP 50 to 100. If you wish for comfortable and convenient transfers, the resort can also arrange van pick-ups and drop-offs for a fee.